Certification is the clinician’s professional mark of achievement and more importantly a seal of quality care for the public and patients. It guarantees that you know what is expected of you. Advancement. Furthers your career and provides employers with your accomplishment. Credibility. Becoming certified lends credibility to your practice and demonstrates current and safe means of care will be provided. Recognition. Certification recognizes you have the education to treat more patients, instead of sending them to an outpatient facility. A minimum of 500 hours of clinical hyperbaric training and active practice experience per year for the prior 2 years, successfully completing a Hyperbaric Technician Preceptorship in a hospital setting or outpatient facility. What designation may I use after passing the exam? Once you’ve passed your PCHM examination you will want to apply for fellowship with the American College of Hyperbaric Medicine (ACHM). 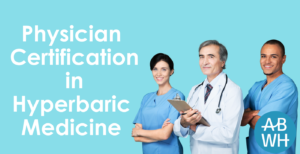 Upon being granted fellowship status, you may use the designation FACHM / Fellow Of The American College of Hyperbaric Medicine. 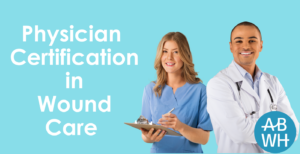 Once you’ve passed your PCWC examination you will want to apply for fellowship with the American Professional Wound Care Association (APWCA). Upon being granted fellowship status, you may use the designation FAPWCA / Fellow Of The American Professional Wound Care Association. 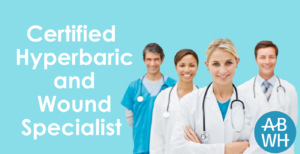 Once you’ve passed your CHWS examination you may begin using the designation CHWS – Certified Hyperbaric and Wound Specialist. 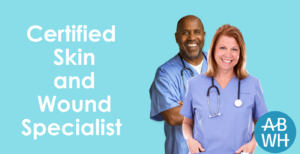 Once you’ve passed your Certified Skin and Wound Specialist examination you may begin using the designation CSWS – Certified Skin and Wound Specialist. Once you’ve passed your Certified Hyperbaric Specialist examination you may begin using the designation CHS – Certified Hyperbaric Specialist. What is the passing rate for my examination? In order to pass any of our examinations you must obtain a 60% or greater. What materials can I use to prepare for the exam? You are given a period of 4 hours to complete your examination. Each examination is multiple-choice. The PCHM examination is 160 questions. The PCWC examination is 165 questions. The CHWS examination is 150 questions. The CSWS examination is 125 questions. If you do not complete your examination within the 4 hour time limit you will be logged out and your score will be calculated. Where are the examinations offered? All ABWH examinations are offered online for your convenience. The examination is proctored using a webcam based proctoring service. In order to take your exam online you’ll need to use a computer with a webcam, microphone, and standard internet connection. We strongly suggest using Chrome, Safari, Firefox or Edge browsers. Once a year the examination is held in person in conjunction with the AWPCA National Clinical Conference. Please visit APWCA.org for a conference schedule.